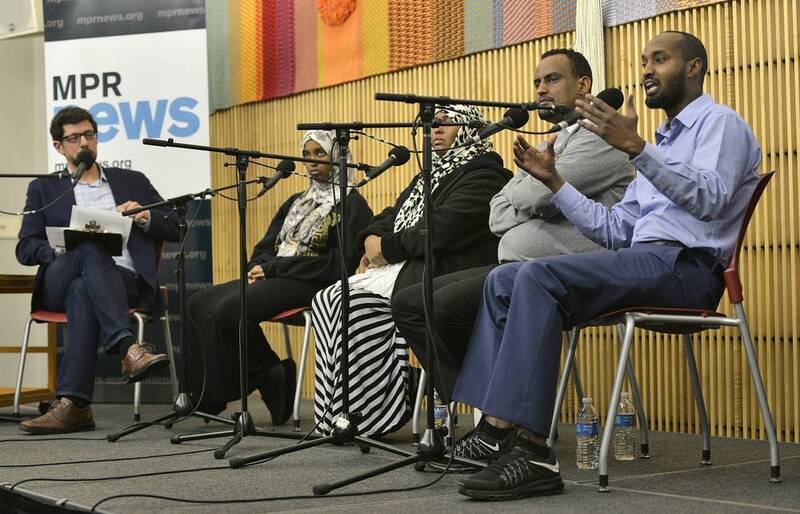 On Thursday, Jan. 28, MPR News with Tom Weber hosted a community conversation about what it is like being Muslim in Minnesota at the St. Cloud Public Library. Below is Weber's introduction to the evening, and highlights of the conversation. A little more than 30 years from now, according to the Pew Research Center, the entire population of Muslims in this country will reach 2 percent. And yet, this vast minority of our population has come under extensive critique in recent months. Millions of refugees, many of whom are Muslim, are fleeing war and terrorism in Syria. But rhetoric on the presidential campaign trail focuses more on their religion than their refugee status. Candidates speak of temporarily banning Muslims from entering the country, but they don't provide any plan for how this would be enforced. 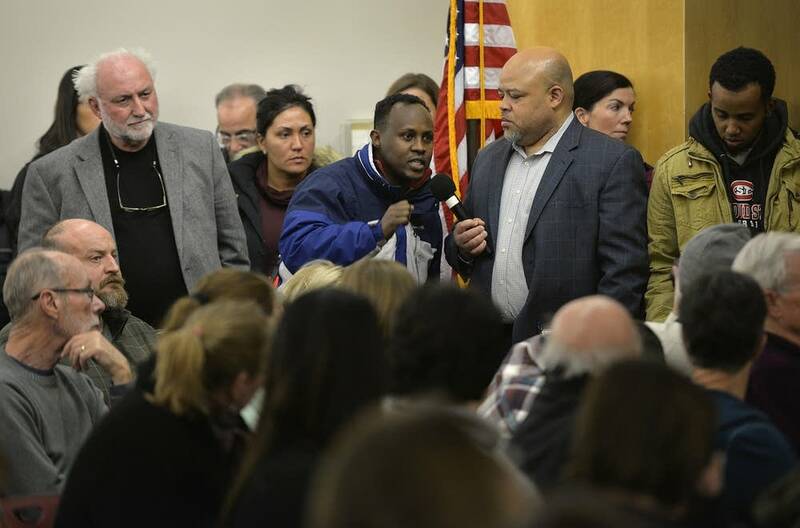 Leaders in the Twin Cities are trying to understand and put a stop to the recruitment of a so far small handful of Somalis who have joined terrorist groups like ISIS overseas. 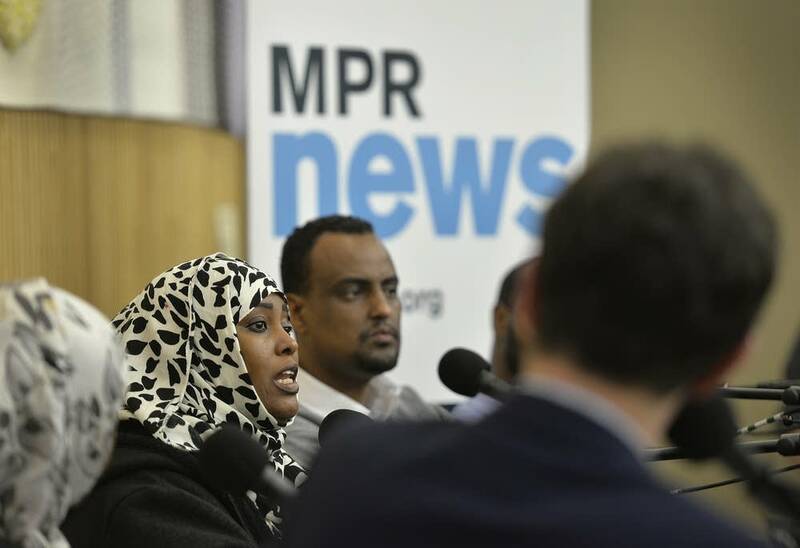 These stories, rhetoric and debates in recent months made MPR News want to explore the Muslim experience in Minnesota. Why St. Cloud? One reason is its growing Muslim population. In St. Cloud, being Muslim is closely associated with being Somali — a fair association — but let's remember that not all Muslims in St. Cloud are Somali. Somalis do make up at least 15 percent of students in St. Cloud public schools. With the rapid change in population, there's been tension here. Worries about a threatened way of life. Worries about racism and children's safety. Worries about what the rest of Minnesota thinks of St. Cloud, given all the attention, and given the developing reputation — fair or not — as an intolerant place. Worries that inaccuracies not rooted in reality are taken and cited as fact. Worries that this grand experiment called America is stumbling in St. Cloud. But people here are aware of this, working on it and talking about it. 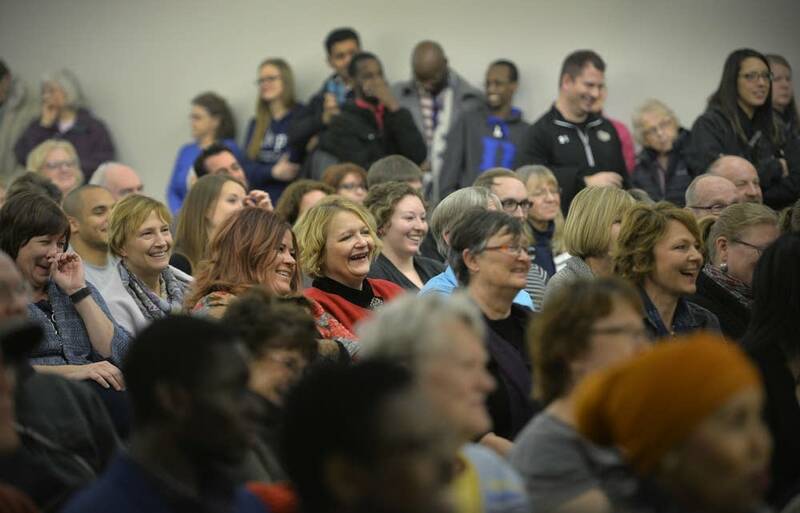 We hoped to listen in on some of that conversation — that's why St. Cloud. We did not schedule this event to pass judgement on St. Cloud as the best or worst place in Minnesota to do anything or be anyone. We scheduled this event before anyone else in recent history made such judgments. We're not going to fix much tonight, I apologize. But we can be the next people to promote understanding, not division. I know that sounds hokey, but I know I'm not the only one here who wants to try. So let's. My guests are all Muslim, and they're here to talk about their experiences. But this isn't a private or closed meeting. Everyone here is invited to the conversation. • Add your perspective: What is life like for Muslims in Minnesota? Haji Yusuf is a community advocate and the founder and CEO of Orange Oak Advertising. He also works with #UniteCloud, a group working to reduce racial and religious tension in the city. He graduated from St. Cloud State University and is the father of two children. Hafsa Abdi is a senior at Technical High School in St. Cloud. She was among the students who walked out of Tech High School last March, saying they were tired of feeling harassed about their race and religion. Hafsa graduates in May and will study nursing at St. Cloud State this fall. Lul Hersi is a community advocate and the mother of four children, including Hafsa. She's lived in St. Cloud since 2001 and works as an interpreter. Hassan Yussuf recently ran for St. Cloud school board and owns a tax business here. He graduated from St. Cloud State and has a master's degree from Minnesota State University - Mankato. Yussuf is one of the founders of a group called "Eradicating Achievement Gap & Learning Empowerment," and is the father of four children. "Change was promised at the end of last year and change is happening." "When a kid experiences racism or prejudice or discrimination, it is used to incite other Muslims against our country in the U.S.A."
"It is not all of St. Cloud, it is not a majority of St. Cloud, it is a few ... that spoil the rest of the name of St. Cloud. ... It is the few that are making the headlines." "There is an issue that we call 'innocent fear': That people have innocent fear of the unknown. They see people coming into their town in large numbers, they see overseas people who are being killed by people who look like the ones here. So, they are afraid they think that somehow these people will blow them away. This fear — the only way it can be cured is by knowledge." 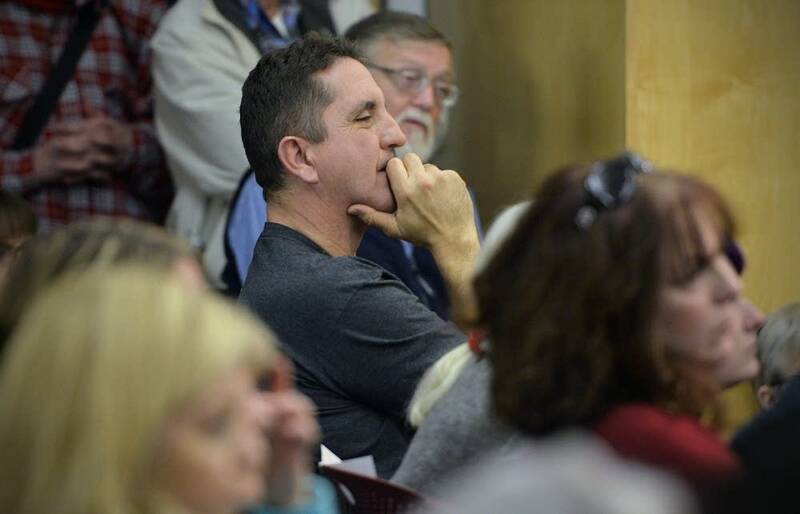 "That headline was terribly wrong, that headline didn't do us any favors as a community. ... It just took away everything that we should be talking about." "How much more should we assimilate to the American culture that we aren't doing right now? Does it mean that I have to take off my hijab? To wear something I am not raised to wear? Does that make me an American? Or are you going to accept me as who I am?" "As a black man born in America, I know a little something about racism. ... That problem we're not going to solve because some people just weren't raised very well. ... It doesn't matter what you are called, it only matters what you answer to."